A secret weapon I use for profitable trading is regular stock market trend analysis. Here are two reasons why also you should analyze stock market regularly. There are investors that still prefer mantra of buying low and sell high. This was case of decades from 70’s till 2000. 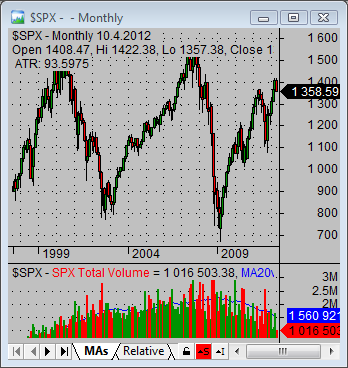 But since then stock market indexes are in wild ride up and down. Buy and hold strategy for retirement is not working any more I think. The maximal holding period had to be shortened to few years maximally and only active self directed investor who knows how to sell stocks sooner can survive and make money also by this type of investing approach. The stock price chart above of major US market index demonstrate how market changed its behavior during first decade of 21st century. Also, I’ve met a lot of people during my online securities trading career who trade without any idea of trending. I noticed that these people totally concentrate on their own ideas about what a stocks or the market should do. They try to order the market what to do. And it fails to do it, and over time these traders and investors fail. You should avoid this mistake. And stock market trend analysis is very useful tool that protects your money. Your personal brokerage account is too small to have ability to move a market, sector or individual ticker shares. These moves are arranged by inflow or outflow of huge amounts of capital provided by large institutional investors like investment banks, asset managers, hedge funds, mutual funds, insurers and so on. So, to trade against the trend is like swimming against a very strong stream in the river. It’s much easier to jump into the boat and let the stream move the boat without using your own energy. The only way to survive on the stock market is to identify the prevailing market trend and/or a trend in a specific sector or shares. The stock market strategy for swing traders or position traders must be realized with knowledge of these key stock market terms. Technical analysis has several instruments that are very helpful in this matter. You should utilize regular stock market trend analysis. Such routine should help to improve results for both – short term traders and mid term active investors.